Crate training is a part of many successful training programs. It is important to remember that the crate should never be used as a place for punishment if this approach is going to be successful. Like any training program you will need consistency and patience to achieve the desired results. Crate training is best integrated into any program early in your attempts to train your Pug. One of the first things you want to achieve is to have your Pug have some level of comfort in going into the enclosure. You can do this by following a simple procedure on a consistent basis. This is best done after your Pug has had an active session of play or running around and is a little tired. Place a folded towel into the crate along with one of his favorite toys like a chew toy. When your Pug has tired himself out a bit put him into the crate with his favorite toy. Close the gate or door once your Pug is inside and walk away quickly. Remember, one of the principles of crate training is to never use the crate as a place for punishment. You want to leave the room for ten or fifteen minutes. When you come back open the door to let your Pug out but do not pet him or even speak to him. Definitely do not give a treat or in any way reward your Pug for getting out of the crate. Act as if nothing out of the ordinary has happened. Several times during the day repeat the above practice. It does not have to be after a period of activity each time. The first time is easier if it is done when your Pug has tired himself out. The learning, and part of what make crate training successful, is to reinforce the practice with your Pug of going in and out of the crate as part of a program so that your Pug will have no problems going into his crate when you want him to be there. If your Pug becomes restless or agitated it is usually a sign that he needs to relieve himself. 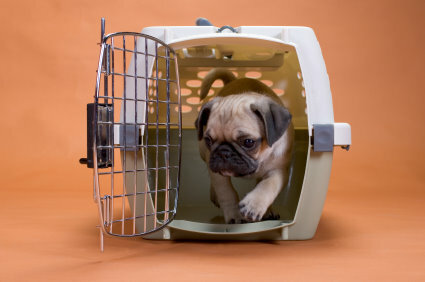 One important reason to get your Pug to appreciate their crate is that it is the safest way to transport a Pug. Most owners think that harnessing a Pug in a car is enough but it is actually better and safer to have your Pug in a crate for added protection. Crate training is just one approach in a Pug training program. There are many different philosophies in how to have a well trained dog. There are many training resources on the market and, if you have an interest, you can easily start a training library. One of the better resources is a home study course that has gotten excellent reviews.